As if I needed more of a reason to buy local, I bought my first bouquet of Omniflora flowers at the most recent Portsmouth Farmers’ Market! I had seen them go by when I was working at market, and was mesmerized by the variety, colors, and quality that I could see, so I knew I had to pick some up for myself. Needless to say that when I did, I wasn’t disappointed. Located in Kittery, Maine, Omniflora Farm is run by Jess Romano, a passionate grower and floral arranger of many varieties of flowers, as well as grower of food items like berries and vegetables. Her farm was established in 2017, after 14 years of devotion to horticulture and field work, and she believes in and practices transparent growing techniques, which consist of sustainability and quality assurance. This careful attention to quality is compared to the care that comes with growing the food we eat, according to the farm’s website. Omniflora also reminds us that buying locally drastically lowers the carbon footprint of our purchase of flowers because of the lack of the added transportation needed to deliver them, not to mention the energy required to store them properly for long periods. 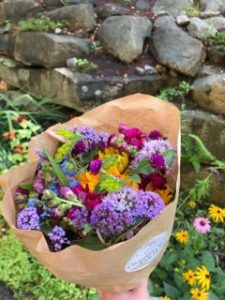 Omniflora has a few CSA share options that would suit any flower lover, such as a bouquet a week between May and October, a weekly custom bouquet pickup, and a “bucket-o-blooms”, which is a large bucket of loose-stemmed flowers once a week between May and October. Omniflora also offers fresh bulk flowers for events such as weddings and other social events, which is wonderful in itself with the flowers, but with the added bonus of saving in shipping costs and lowering the carbon footprint associated. Jess also has some job opportunities posted for those wildly interested in growing local flowers, with a current position for a part-time farmhand posted, which can be found at https://www.omniflorafarm.com/opportunities/. As with anything having to do with Omniflower Farm and their flowers, they ask you to call or email with any questions or concerns! And as always, be sure to always be in conversation with your grower about growing practices, CSAs, work and volunteer opportunities, and more!